Scientists have devised a way to build a “quantum metamaterial”—an engineered material with exotic properties not found in nature—using ultracold atoms trapped in an artificial crystal composed of light. The theoretical work represents a step toward manipulating atoms to transmit information, perform complex simulations or function as powerful sensors. The research team, led by scientists at the Department of Energy’s Lawrence Berkeley National Laboratory (Berkeley Lab) and UC Berkeley, proposes the use of an accordion-like atomic framework, or “lattice” structure, made with laser light to trap atoms in regularly spaced nanoscale pockets. Such a light-based structure, which has patterned features that in some ways resemble those of a crystal, is essentially a “perfect” structure—free of the typical defects found in natural materials. Researchers believe they can pinpoint the placement of a so-called “probe” atom in this crystal of light, and actively tune its behavior with another type of laser light (near-infrared light) to make the atom cough up some of its energy on demand in the form of a particle of light, or photon. This photon, in turn, can be absorbed by another probe atom (in the same or different lattice site) in a simple form of information exchange—like spoken words traveling between two string-connected tin cans. Zhang is also a professor at UC Berkeley, director of the National Science Foundation’s Center for Scalable and Integrated Nanomanufacturing and a member of the Kavli Energy NanoScience Institute at Berkeley Lab and UC Berkeley. Pankaj K. Jha, a UC Berkeley postdoctoral researcher who is the lead author of the paper and works in Zhang’s group, said, “Now we have control over the speed of the release of a photon, so we can optically process information much faster, and efficiently transfer it from one point to another.” Other scientists who contributed to this work include Michael Mrejen, Jeongmin Kim, Chihhui Wu, Yuan Wang and Yuri V. Rostovtsev. This ability to release a photon at fast rates, and to transmit it with low losses from one atom to another, is a vital step in processing information for quantum computation, which could use an array of these controlled photon releases to carry out complex calculations far more rapidly than is possible in modern computers. A quantum computer, which the tech industry and scientific community are hotly pursuing because of its potential to perform more complex calculations than are possible using modern supercomputers, could tap into the bizarre quantum realm in which ordinary physics rules don’t apply. While today’s computers can store information as binary bits—either ones or zeroes—a quantum compter would use “qubits” in which an individual bit of information can simultaneously exist in multiple states. These qubits could take the form of atoms, photons, electrons, or even as an individual fundamental property of a particle, and would exponentially increase the number of calculations a computer could perform in an instant. The non-uniform distribution of the ultracold atoms in the artificial crystal is a key to this latest study, said Jha. “It makes the crucial difference for creating a ‘perfectly’ lossless and reconfigurable quantum metamaterial,” he said, allowing the optical structure of the artificial crystal to be reconfigured from an open geometry (hyperbolic-shaped) to a closed one (elliptical) at the same frequency and with ultrafast timing. This controllable shape-change dramatically changes the speed at which a probe atom in the artificial crystal releases a photon. 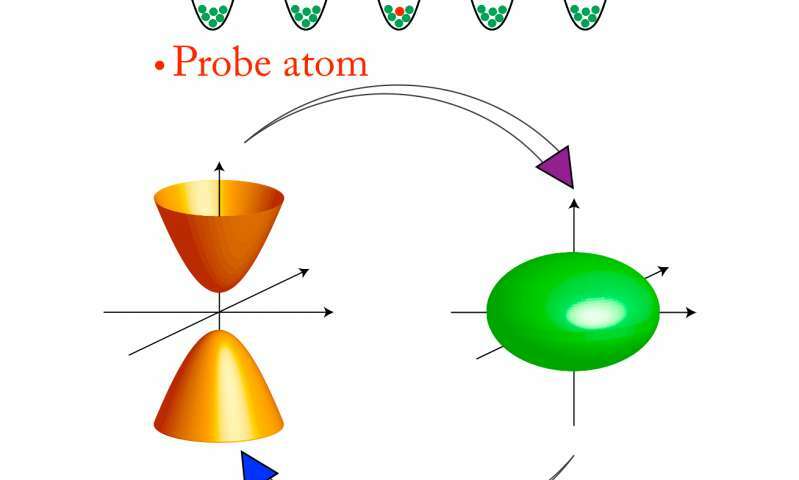 The latest proposal suggests that it is possible to speed up the rate at which a probe atom can emit a photon from nanoseconds, or billionths of a second, to picoseconds, or trillionths of a second. Also, this process is importantly considered “lossless,” meaning the photons would not lose any of their energy to their surrounding structure as they likely would in a traditional material. This overcomes one hurdle toward quantum computing and information processing. Atoms planted in the artificial crystal could also possibly be induced to hop from one place to another. In this case, the atoms could themselves serve as the information carriers in a quantum computer or be arranged as quantum sensors, Jha said. The researchers found that rubidium atoms are ideally suited for this study, however barium, calcium and cesium atoms can also be trapped or planted in the artificial crystal, as they exhibit similar energy levels. While the artificial crystal used in the study is described as one-dimensional, Jha said the same approach could be easily extended to create 2-D and 3-D quantum metamaterial crystal structures out of light. To realize the proposed metamaterial in an actual experiment, Zhang and Jha said the research team would need to trap several atoms per lattice site in the artificial crystal, and to hold those atoms in the lattice even when they are excited to higher energy states. Schematic of an atomic lattice quantum metamaterial. We introduce and theoretically demonstrate a quantum metamaterial made of dense ultracold neutral atoms loaded into an inherently defect-free artificial crystal of light, immune to well-known critical challenges inevitable in conventional solid-state platforms. 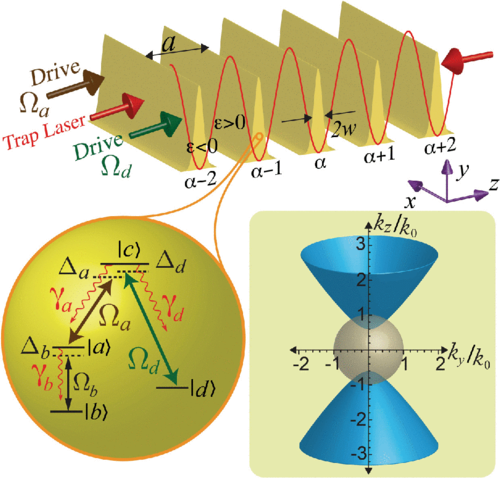 We demonstrate an all-optical control, on ultrafast time scales, over the photonic topological transition of the isofrequency contour from an open to closed topology at the same frequency. This atomic lattice quantum metamaterial enables a dynamic manipulation of the decay rate branching ratio of a probe quantum emitter by more than an order of magnitude. Our proposal may lead to practically lossless, tunable, and topologically reconfigurable quantum metamaterials, for single or few-photon-level applications as varied as quantum sensing, quantum information processing, and quantum simulations using metamaterials.